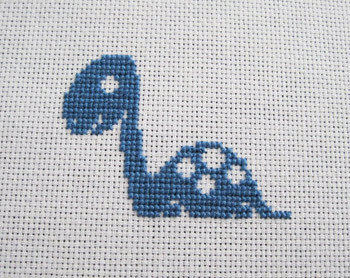 As I mentioned last week, I'm stitching a dinosaur thing for my nephew's birthday. It's most likely the first of a few kid things I'll be doing early on this year since my BFF is having another kid in a few months. Since I'm on a deadline with the dinos, I'm not working on the square stitch until it's finished. It's also given me the chance to work from a pattern on my Kindle. I briefly tried using a pattern on my phone, but with the battery life and the screen timeouts, it's not the best way to go. The Kindle is bigger, takes longer to go to sleep, and has great battery life. So far it's working out pretty well, although I don't know how it would work with a more complicated pattern. You can only zoom in so far, so if the pattern had a bunch of colors close to each other, it might get confusing.